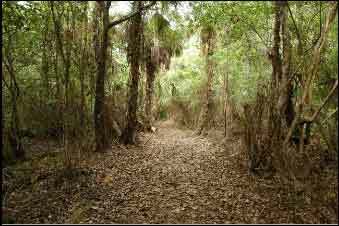 While it’s great to experience the interior of America’s only tropical forest from the comparative comfort of the Boardwalk on Tamiami Trail, The Fakahatchee Strand Preserve State Park contains dirt trails suitable for all interests. Ranging from the 2.5-mile long West Main Trail to the 12-mile long East Main Trail, these offer a closer view of this wilderness. However, as overnight camping is not permitted, the longer trails cannot be completed on foot and may only be visited by walking as far as possible then turning back. That is, if you are not one of the hardy marathon runners who take part in the annual tough ‘Ultra’ Marathon run each February. Or if you don’t own a mountain bike (and have extensive experience in trail riding). In May 2015 I decided to attempt a circuit of the longest trio, East Main − Pennington Post − Uplands trails and back to the start by mountain bike before the summer rains curtailed it. Primed by numerous past experiences, I knew “if anything can go wrong it will.” I have a mountain bike with 2.1” tires, rear carrier and panniers containing anything I need on a long bike trip. Helmet – Apart from a spill, it protects you against low hanging branches. At least wear sturdy head covering of some kind. Insect repellent in summer, sun lotion. Long sleeved shirt and long pants – In May there are still few mosquitos or bugs, but it helps prevent scratches especially from trackside thorns. Lightly tinted eye shades – not for sun but to protect the eyes from low hanging branches and vines. Protective foot wear – at least sneakers and better, light boots in case you end up pushing your bike through mud or over rough ground. Adequate water! The amount differs with size, but as a rule of thumb you need at least a pint an hour. A liter weighs 2 lbs. but that’s no problem if your bike is carrying it. Before you set off, pre-hydrate by drinking as much as you can – up to a liter. Carry at least 4 liters on this trip. Freeze a couple of pints overnight so they stay cool in your pack. On return to your car you will need to re-hydrate for some time after, so have more water there also. It is a good idea to puncture-proof your bike as far as possible. At least, install a plastic liner strip between the tube and tire and/or Schwinn Self-sealing tubes. You can even buy Teflon reinforced tires to stop thorns in the first place. If not handy or not inclined to DIY, a bike shop will do this for you but you must know how to change a tube when you are miles from anywhere. I recommend also carrying a can or two of bicycle tire inflator with sealant, obtainable at Walmart and most large stores. Purists may sneer, but it saves time and works well with small thorn punctures. Bicycle pump, 2 spare tubes (better than trying to repair with patches without a water source to locate the problem). Trail map, GPS and/compass (Thick tree canopy may hinder satellite coverage) If you follow the blue ribbons remaining after the last Ultra marathon you could dispense with GPS but it helps to take a map reference or confirm your location – especially in emergency. Let someone reliable know what route you are taking, with estimated completion time. Bicycle adventures in the Fakahatchee Strand are best attempted in the company of others. Consider joining the annual Everglades Bike Ride, Sunday, March 13. The 27-mile Bumpy Ride includes Janes Scenic Drive – a portion of the registration fee benefits FOF. To register and for more info, see https://raceroster.com/events/2016/6573/everglades-bike-ride or phone Patty Huff at (239) 695-2397. 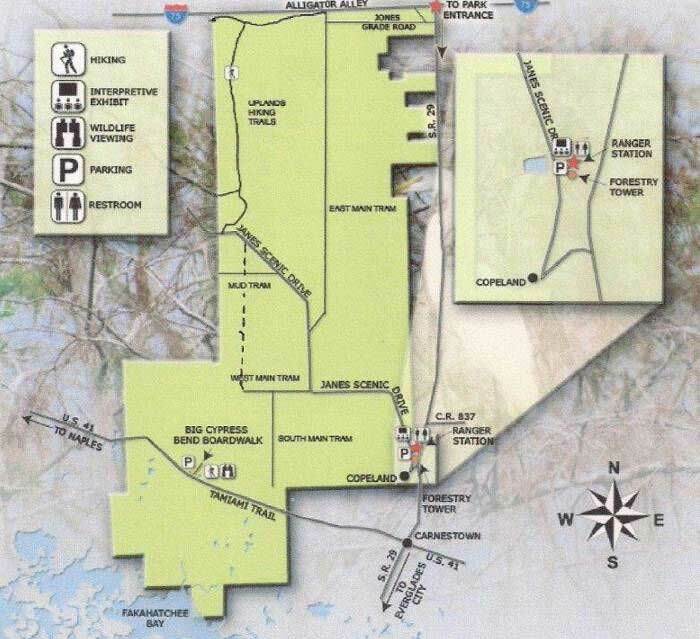 Start at Gate 12 on Janes Scenic Drive, 6.5 miles from the start of the dirt road in Copeland, and travel N. on East Main Trail. After Ballard Camp – 2 miles in from the start, the trail steadily deteriorates. Hazards are occasional washouts covered by a few planks of lumber, fallen trees and branches and vines which sometimes snake across at face height. Be especially careful not to ride over or brush against the Smilax vine which is armed with sharp thorns. I stop and carefully set them aside. After 12.0 Miles you reach the junction with Jones Grade Trail N.26° 08.496 W. 081° 23.887 (that heads E. to Rt.29 in case of emergency). Continue north .5 miles and trail bends west at N.26° 08.849 W.081° 23.887 then runs parallel with I-75 which lies about a mile to the north and you hear faint traffic. The trail displays occasional blue ribbons. The tree cover thins but the overhead canopy remains for long distances, which can lose satellite coverage here and there if you are using a small or older GPS unit. After 3.57 miles from the junction with Jones Grade you see the first, less obvious Uplands trail section headed south at N26°08.828 W.081°26.146. Ignore it and continue on. After a further 1.41 miles you reach the second Uplands Trail headed south, at N26°08.918 W.81°26.615. It should also still be marked with blue ribbons. Turn south here and follow the most clearly beaten trail marked with occasional blue ribbons, as there are several side trails. It tends to curve and zigzag both S.E. and S.W. through stretches of upland pine in the northern stretch, changing to open marl prairie in the southern section which will become swampy in summer. There are also occasional sections of protruding rock above the trail surface which make for a bumpy ride. After approximately 11 miles you reach Jane Scenic Drive opposite the entrance to Picayune State Forest at N. 26°053087, W.081°455758. Now bike 5.0 miles back to the start at Gate 12, and you have completed approximately 33 miles. With occasional stops, lunch and to change a tube, it took me 7 hours. During that time I did not encounter a single person – hence the need to take the precautions I have detailed above. Tony Marx is a Florida Master Naturalist. He is a volunteer interpreter for the Fakahatchee guided tram tours and frequently contributes articles to The Ghost Writer.